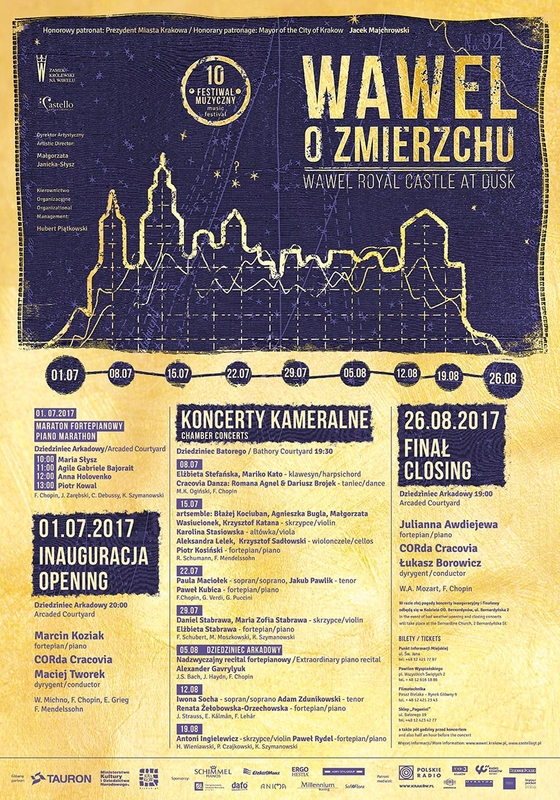 This extraordinary musical feast is being put on once again by Wawel Royal Castle and the Castello Creative Group (Grupa Twórcza Castello). The honorary patron of the event is Jacek Majchrowski, the mayor of the city of Krakow. The music of Chopin, Verdi, Bach and Strauss, among others, will ring out on Wawel’s historic Arcaded and Batory courtyards for 9 successive Saturday evenings. The place where the rulers of Poland once proudly walked will become an exceptional concert hall. This will all be complemented by excellent acoustics, the backdrop of the castle’s historic architecture, and the atmospheric dusk. This year’s programme includes the Grand Piano Marathon, the inaugural concert, seven chamber concerts (including a special piano recital by Alexander Gavrylyuk), and the closing concert.